In 1857, the great Hudson River School painter Frederic E. Church unveiled his 40” x 90” painting of Niagara Falls. The fascination with and publicity about the painting brought out more than 100,000 people who each paid twenty-five cents to see what was then considered a colossal masterwork. That enthusiastic public response was not accidental or unexpected. From the very beginning of his celebrated career, Church attracted attention to his work by creating large, blockbuster sized landscape paintings of exotic, unknown, and captivatingly dramatic locations. Some of those depictions were reports of what the artist actually discovered on location, and other paintings were imaginative compilations of the plant material, animals, volcanos, rivers, waterfalls, and people the artist sketched and painted when he made trips to Central and South America, Cuba, and Mexico. The challenges he set for himself in terms of both the physical and creative aspects of these projects were monumental. Church was not the only great American artist who built his career on attention-getting, large-scale paintings. Albert Bierstadt filled massive canvases with dramatic storms, skyscraper sized waterfalls, and remote mountain landscapes; and some of the best wildlife artists of the 20th century, including Carl Rungius, created large, curved dioramas for natural history museums by referring to studies created on location in Africa, South America, Europe, and the United States. The challenge of painting massive canvases didn’t originate with American artists. Long before, European masters like Rubens, Tintoretto, Delacroix, and Monet proved their talents and physical capabilities by filling cathedrals, palaces, and castles with series of large-scale paintings. Their murals, frescoes, mosaics, and canvases celebrated successful battles, conquests by a monarch, miracles performed by a saint, or wonders of the natural world. And while they brought attention to the events depicted in the works of art, they also elicited wide respect for the talented artists who accomplished such amazing artistic feats. The challenges that brought out the best in artists of the past continue to inspire artists who have something important to say through their major works. One of today’s most gifted and dedicated American artists is preparing to celebrate the wildlife species in Africa on an unprecedented scale. 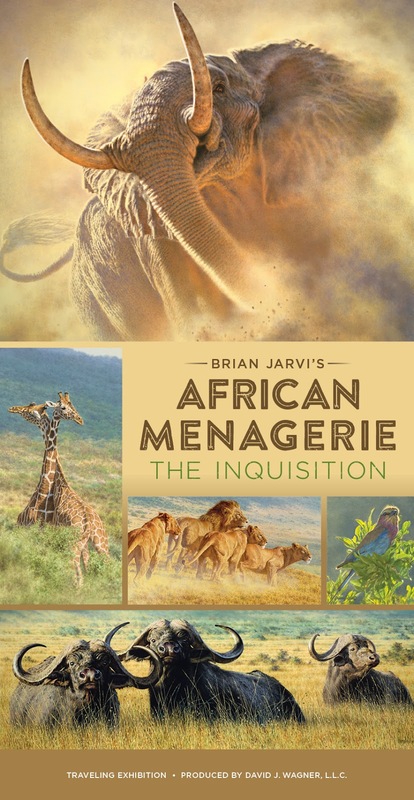 Brian Jarvi has spent the past fourteen years realizing a dream grounded in his childhood fascination with collections of local animal species and informed by his lifelong studies of Africa. He will complete a series of seven large-scale, interlocking panels and related supporting studies that summarizes his understanding of life on the continent and his hopes for the future. Together, these thoroughly researched images will achieve the scale and impact of the monumental work of art executed by Church, Bierstadt, Rungius, or other historic masters. 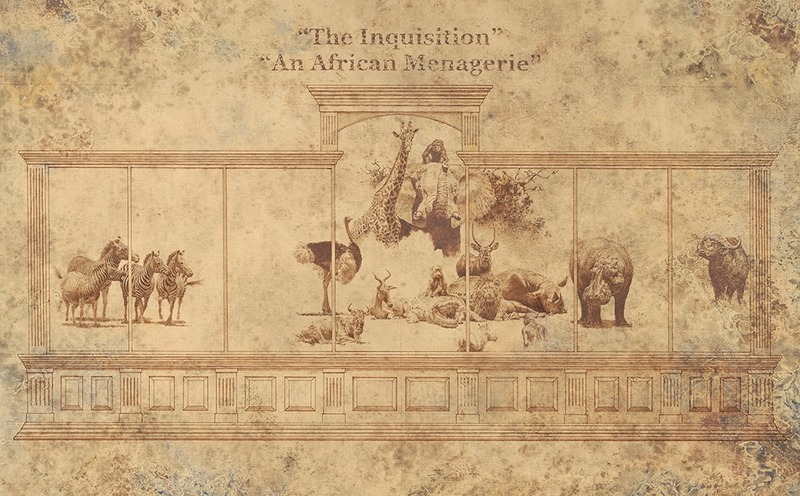 The artwork resulting from this 25 year devotion to Africa falls into two general categories, both of which are in evidence in the exhibition of work related to the African Menagerie project. Some pieces are perceptive portraits of specific people, animals, and locations; and others are dramatic stories about the lives of those portrait subjects. That is, Jarvi creates images of individual tribesmen, lions, rhinos, leopards, and antelope as if he were painting commissioned portraits of African dignitaries. There is as much respect, love, and understanding of his subjects as there would be if he were painting portraits of family members or neighbors. He reveals both the unique personality and likeness of his subjects with such perceptive skill that viewers feel as if they have just been introduced to a living, breathing, resident of the earth. While studying and portraying these individuals, Jarvi begins to develop concepts for paintings that might summarize his ideas and emotions and, at the same time, will engage viewers of his paintings in a broader story. In most cases, these concepts are only vaguely connected to a real event or image. It’s more likely that the story takes shape in Jarvi’s imagination, prompted by his thorough knowledge of Africa, his talents as an artist, and his gifts as a communicator. For example, the painting Last Gladiators began as an idea that gradually took a definite shape as Jarvi combed through thousands of his own photographs, read through reference books, tried out dozens of compositional schemes, and created monochromatic studies of animals. Those studies were wiped out, repainted, wiped out again, and continuously adjusted until Jarvi knew he had a basic image that had pictorial impact and was accurate in terms of the elephants’ anatomy, perspective, and attitude. Only then did he go through the long process of bringing the image to life with layers of oil colors. Sometimes the concept for a painting comes from an image buried deep in Jarvi’s memory, as when he created Overlord. 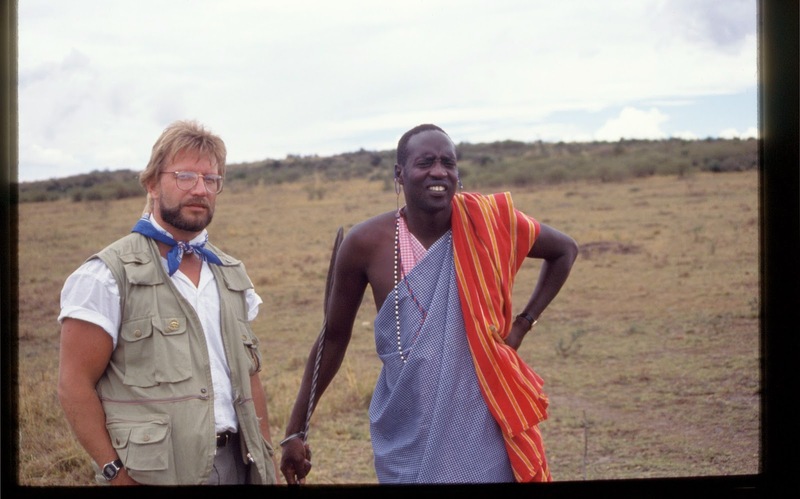 “About 25 years ago I saw a leopard perched in a tree with sunlight filtering through the lush vegetation,” Jarvi recalls. “It was such a captivating scene that it stuck with me for all those years even though it only lasted a few moments. I started making sketches of how I might recreate those moments that said so much to me about the African environment and the life of the animal. I dug back to find some of the slides I had taken at the time, played with some oil sketches, and gradually developed an image that captured the impact and meaning of those distant memories. Jarvi says that sketching with oil colors is actually a better way for him to evaluate a potential painting composition than working with graphite, charcoal, or pastel. “I like to flesh out an idea by painting in a dry brush manner using a soft brush and oil color pulled straight from a tube,” he says. “For me, that’s closer to the way I will eventually develop a painting than if I were to make a linear sketch or value studies in charcoal. Moreover, I can keep wiping off and reapplying one earth color until the sketch accurately captures the concept that has been whirling around in my head. I use the same technique when I move to a big panel and start developing the final painting because I like seeing the composition without color. It’s a way of testing the design and the accuracy of the depiction before I consider the colors. “I’m never willing to stop when a painting is ‘good enough,’” Jarvi says in explaining his creative process. “Some paintings take me years to finish because I keep thinking of ways I can improve them. That’s especially true when I’m dealing with the drama of Africa wildlife because I have so much respect for the animals and for the people who view and collect my work. When I finally sign a painting, I expect to feel as though I have been living with live animals and learning everything I can about the way those specific creatures move, respond to situations, interact with each other, and exist within a changing environment. And if I have done that, I hope viewers of my finished paintings will have the same sense of connectedness, understanding, appreciation, and respect.